Whether you're looking for a copy of our logo or are interested in which department uses which colour, our brand guidelines tell you everything you need to know about Welford's image. For general and informal uses, the company name Welford should be used. Welford should always be written with a capital "W" and the rest of the name in lowercase, with the exception to the Welford logos - see below. In formal situations such as contracts, the full company name, Welford Media or Welford Media Ltd, should be used. The primary Welford logo is formatted with a white background and red text, with the company name in all capital letters. In a situation where the white background can't be used, a red background with white text can be used instead. Department specific colours should only be used when the logo is referring specifically to the department. No other colour combination or design should be used without prior permission from Welford. Welford's main colour is HEX #F53D3D, RGB 245,61,61 or HSL 0, 75% 60%. This colour should be used for any general Welford branding, as well as on the Welford logo. If a department's logo or colours are being used, the colours should correctly match the department and be used to represent the correct services. For Welford Studio, you should use HEX #F53D3D, RGB 245,61,61 or HSL 0, 75% 60%. Welford Growth should use HEX #0DF2A6, RGB 13,242,166 or HSL 160, 95%, 50%. 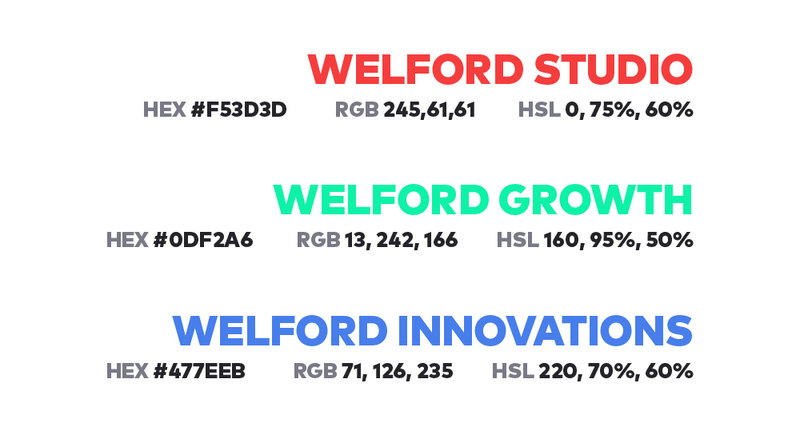 Finally, Welford Innovations should use HEX #477EEB, RGB 71,126,235 or HSL 220, 70%, 60%. 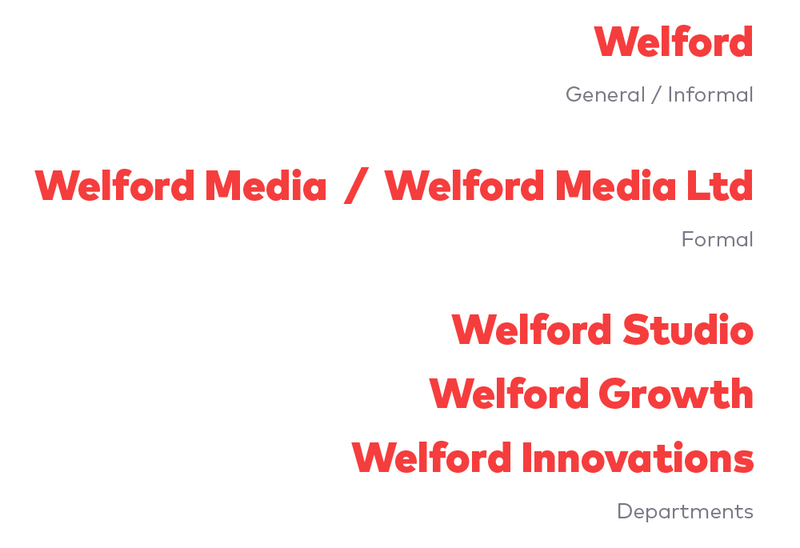 The primary font for Welford's branding is FF Mark®. This is used in both FF Mark® Black and FF Mark® Regular versions across the Welford logos, website and marketing documents.